I have spent the last few weeks doing the latest round of my quest for the "right" GTD system. Once again I come up empty-handed and arrive back at "good old" Toodledo. I guess before I even start, I should say why I end back at Toodledo: it is rock solid, the web app is accessible everywhere, and there is an excellent Android app (Ultimate ToDo List) which is also rock solid and works just fine in offline mode. I can put up with a lot of irritation in a GTD system, but I cannot put up with a system that cannot work well in an airplane nor can I trust a system that every so often just loses a task. So why am I not happy with Toodledo? It is too complex. There is a large set of things you can set for a task: start date, due date, status, goal, priority, context, tags, folders ... and these things are all pretty much independent of each other. If I decide to move a project from one context to the next, it's not a given that I could just tell the project "now you are at work, no longer at home". A project has individual tasks and each of them has its own independent context. If you implement projects using the parent task / subtask system it's even worse. You can have subtasks of a parent that reside in completely different folders. Which in most cases is sheer nonsense, and results in tons of clicking to update the various fields of all subtasks to be the same as the parent task. Except of course the status field, because usually only one of the subtasks is the "Next Action". Also : Toodledo has no concept of a defined order of tasks: order is the result of sorting. To get your tasks into some reasonable order, you wind up fudging, like adding a "start date" to the task and sorting on that. This date of course has to be frequently updated, because you probably don't finish things when you think you would, and then that low priority tasks you thought you might get to a month ago is riding at the top of your todo list for no good reason. So I went looking. What was I looking for? * A "cloud" based system. I regularly use four different computers (work desktop, home desktop, laptop, and android smartphone) and they should see the same view of my tasks. Either I can spend a lot of time manually synchronizing, or find a system that will work via Dropbox, or a system that is "cloud" based, which really means only that all your tasks are stored somewhere on the internet; the thing running on each of the computers knows where that "somewhere" is and keeps the view on your computer in sync with what is on the task server. * Task import of some kind. I've found out the hard way that I can't really get an idea of how a system will work for me until I have a hundred or so real tasks in the system and actually try to use it. Entering 100 real tasks takes a long time. So unless the system looks otherwise perfect, I don't even bother if there is no good import method. Acceptable import methods are e.g. direct import from Toodledo, import of a CSV file (that I can export from Toodledo) or the ability to email tasks with metadata syntax, so that the tasks can be directly sent into the proper contexts, folders, get the right due dates and tags, etc. I have a script that zips through a CSV export from Toodledo and mails the tasks off. Not as nice as direct import but it still works. * A good user interface, preferably one that lets me drag and drop stuff, one that minimizes the amount of clicks things take. And preferably one that lets me make my own ordering of tasks, independent of due dates or whatever. * A solid android app on which sync works perfectly, which can be used in offline mode (meaning as well that tasks entered in offline mode will be synced once an internet connection is available again!). It should also have an excellent user interface allowing for quick capture of todos and quick viewing of (or marking "done"!) the most important tasks. * A viewable archive or log of completed tasks, including the date completed. * Even better is if one is able to record time spent on a task, and this information is also available in the archive. And the archive can be exported to e.g. a CSV file for processing outside the system. * Documentation. It's amazing how many systems out there have no documentation whatsoever! * Ability to email tasks to the cloud interface, including setting metadata like due date and project name via a special syntax. * Ability to search the task list (including attached notes) and also filter the task list given some criteria. An optimal filter system allows boolean composition of filters, like "todo in (Folder A OR Folder B) AND (Context is Computer or Work) AND Status is NextAction". * Task export of some kind. I've found out that sometimes I think a system is going to work and it doesn't; then I want to migrate to something else. In order to do so, I need to have some sort of task export, one which is complete enough that I can import it to another system and not have to manually sort things into folders, set due dates and tags, etc. When I enter these tasks, they surely do NOT belong in the inbox (which is where some GTD systems will put all new tasks, regardless of where you enter them). I know where they belong : they belong in the project folder as tasks in the project. Not all of the tasks are actionable, so they certainly do not all go in "next" focus area like some other GTD systems will do. At the start of the project above, steps 1, 3, and 6 might be "next actions", the rest are all "waiting for steps 1 or 3 or 6". That is not the same as "Someday"; what someday means in GTD is "I might want to do this someday". When I am ready to remove the old wallpaper, I put "remove the old wallpaper" task into the "next action" state, and at that moment it should show up in my next actions list. Not before. Think about Allen's book, written back in the days of paper: you wrote a next actions list, that only contained the next action for each active project, along with some projectless "next" actions. You wrote the list in an order that made sense to you, you did not rely on some external sorting engine to do the ordering for you. Projects had their own folders with project plans in them. When you identified a new action associated with a project, you did not immediately put this action in your inbox. Also, you did not go through all your project folders once a week and collect all the not-yet-actionable items on those projects onto one giant massive "Someday" list. IMO, a good GTD software system should behave the same way. Developers of GTD systems : you are hereby challenged to come up with a "complete" system. Like my old professor Joe Redish said: 0.8 is not equal to one. However, 0.96 is equal to one. Now, I present the systems I looked at, and what was good and what was not, and why ultimately I could not use each of them. The systems I looked at: GQueues, KOI Tasks, SmartyTask, ActionComplete, HiTask, GetItDone, Nozbe, Thymer, and Conqu. * no demonstrably working import and export of task data. There was a hack that I used to populate the system with a good number of tasks, but it required python scripting and was not complete. * tasks could not be moved from a smart queue somewhere else ... you'd have to navigate to a "normal view" first. * the mobile app was not ready for prime time. Offline mode was a bit buggy. * the system was pretty slow. KOI tasks I did not really play with, because there was no way at all to import tasks into the system. Nor export. From what I could tell, it does archive completed tasks, the android app appears to be ok, and filtering and search are ok. No time tracking, no email entry. Another system that I really did not look at carefully, because there was no way to import tasks into the system. The interface looked really nice. Completed tasks are archived but you can't export them. No time tracking, documentation is very thin, as far as I can tell there is no native app for android. There is a web app for iphone that "may work" on Android. This was an interesting case, as it seemed to be really nice. It does have CSV import and export, as well as an android app that I did not get around to checking. I didn't, because the system just cannot function at a reasonable scale (for me). At 155 tasks in the system, firefox was warning me of an "unresponsive script", it was taking tens of seconds to do basic operations. I normally have twice that number of items in the system. Another interesting case. Import was reasonable, export is rather complete (including completed tasks if desired), time tracking included, can make reports of time spent. Email entry of tasks is ok, although it was not clear whether this entry was limited to a single email address (I normally use two, a work address and personal address). One annoyance was that a task contained no visual clue that a note was attached; you had to "open" the task in order to check if there was a note. However I did not get very far with HiTask because it has no Android app. One is coming "real soon now", I am watching. This is a new system. It looks really good and i will follow it, if they make the right choices the system has real potential. I have not given it a serious spin yet, as the Android app is not quite there yet. For example you can't filter by GTD Contexts on the android app. Also, the android app can use some serious streamlining, both in the number of clicks needed to accomplish something, and in the size of the app -- it's by far the largest app on my phone, and takes tens of seconds to load. Plus: it does have sync with Toodledo. Downside : no drag and drop, and this app is the one that by default puts all your project actions into the "Next" focus. There's been plenty written about this system, and I got the impression that it would do just dandy as my GTD system, except: the Android app. The real app from Nozbe is (as of mid November 2011) simply shockingly bad. No polite way to put it. There were a couple of third-party apps for Nozbe that were less bad but too flaky for serious use. * Reasonable import via email with metadata, notes show up just fine. * Completed tasks: can't export them, can view them project by project. * Time management features : can enter time needed but cannot record time used, except perhaps in notes. However not so useful if you can't export completed. * documentation : web page, looks decent. * Email entry is fine, good syntax for setting metadata. * Filtering : kind of primitive, no complex filters (boolean) and no real tag support; can filter either by project, context, or label, no combinations. * Search: ok but does not search in notes, just in titles. This one almost made the cut. It has a nice drag-and-drop interface that works in a way that works for me. Separates the concept of 'due' from 'scheduled' which is good. This was the app that put all new project steps into "Inbox", I hope they fix that. It was a real "drag" to drag all these tasks one by one into Someday. There were a number of features (see below) that were not quite there, but the real deal breaker is that the system was not solid, especially the sync between web version and the smartphone. I had several instances of tasks being entered on the phone and not showing up on the web, and vice versa, or deleted projects on the web that were still visible on the phone. And a few tasks that just "disappeared". * Import does not really work. Undocumented API and tasks added via it are not always visible from the phone. * Export of uncompleted tasks exists. Tasks not visible on phone are often also not in this export. * Completed tasks cannot be exported. * Basic email entry, no syntax for adding metadata to email, or at least I could not find it. * filtering is a bit primitive. No boolean syntax, just select by area, project, or combo of tags. * Search exists, can search in notes, is really slow (tens of seconds). This is the other system I almost wound up using. They basically have everything I want (with the exception of the export to CSV not containing all the data). The only thing that was missing here was the Android app. They have a web app that "sort of" works, I really made a sincere try to use it ... I imported my entire Toodledo system into Thymer and used it as my primary system for about a week. The web app just doesn't cut it. If you try offline mode, then the android version gets out of sync from the web version for a short while. So no looking at your tasks when you're in an airplane or in another country. A couple of outstanding features of thymer are the way notes are supported (more like a logbook), and the way time recording is handled. The filtering function in thymer is VERY powerful. There are a lot of features geared towards use in a product team, I did not try them but they looked awful nice. I'm still waiting ... and still struggling to make Toodledo work for me in the meantime! I am following both Nozbe, Thymer, and HiTask closely to see what they are doing with Android. I may still give Conqu a serious test, and will probably check back on GetItDone at some point to see whether the robustness has improved. Any of the above systems could still make the cut if they make the right choices! * NirvanaHQ - will tick a lot of your boxes especially in terms of project handling where it seems very strong. It has two big holes for you: (a) no import and (b) no native mobile app for any device (although their mobile web app is quite mature). * Wunderkit - nothing released yet but looks like it will be a beautiful web-based app. Don't know what they will do for mobile, etc. Re: tasks that re not, as of yet, next actions. The way I have always handled this was to list them in the notes of the particular project I was working on. Then when the current "next action" is done I would look at the project notes for the remaining tasks that I previously came up with and pick the next action. Been doing that for 13 years since I first heard David Allen speak in 1998! @PeterW thanks. I had seen Nirvana, but the mobile web app put me off. I have played with two (GQueues and Thymer) and neither was really satisfactory. @donramm thanks. Somebody else pointed something similar out. I may move my "project support" stuff over to Evernote. This might work particularly well if Nozbe's Android app becomes usable, or if GetItDone becomes more solid, as both have Evernote "integration". This message was edited Dec 08, 2011. Now that is a post! Thanks for putting it together for us, I don't know about everyone else, but it has really helped me. Thanks for that post. I have also tried most of those programs, but by far did not record why I don't use them. The reason I keep using TD is for its ability to customize and it is complex enough to handle my needs. I use the "Status" field to deal with the above when adding tasks. I assign "Status" (and all other fields I use) immediately when capturing a new thought. Hold = tasks for the project that are "waiting for steps 1 or 3 or 6"
When I complete the "Next Action" for a project, I can quickly filter for "Folder = project name AND Status = Hold" to find the item that becomes the new "Next Action." You can prefix task names with 01., 02., 03., etc. to get the order you want (and set Sort by name). I don't do this often because my list of "Hold" items is usually short enough to quickly identify the new "Next Action" (i.e. I usually don't have complex projects with 10+ tasks after the next action). 10 tasks is the number that I can fit on my Android phone screen in Portrait mode without having to scroll. So why am I not happy with Toodledo? It is too complex. There is a large set of things you can set for a task: start date, due date, status, goal, priority, context, tags, folders ... and these things are all pretty much independent of each other. You can tell Toodledo/Ultimate To-Do List to hide the things you don't use (e.g. I don't use tags, goals, or start dates, so I hide the fields). This message was edited Dec 26, 2011. Thank you for putting together a great post. Please keep us updated on your investigation, which is a great service to all of us overworked people. I like many aspects of Toodeldo for GTD, though have also encountered the problems you mention. I have a Toodledo configuration that works far better than the not-Toodledo software I was using before, but acknowledge that there may be something yet better out there. If you find it, let us know. Thanks again. Nice post, I think your experience mirrors many of ours. Like you, I've gone away and came back to TD with UTL on Android several times because the alternatives always have features that are lacking. 1.Task ordering- I have struggled with this myself where I waver between ordering the list or just filtering by due date, start date, priority rating, context, etc. I'm not sure this is a feature that would be good to be in the practice of using if it exists. First of all, it is against core GTD principles to try to order your lists. According to Allen, it's much more important to have complete lists than to try and prioritize from 1 to 20 because a main goal of GTD is to avoid constantly prioritizing the short-term urgent over the long-term important. IF it is important to you to use contexts, categories, priority, etc, then I think that manual ordering within those filters would tend to override the whole point of even bothering to organize by those other aspects. The only time I'd want to fiddle with ordering was if I was using a simple system like Wunderlist. The more complex your system (the more fields you select when entering the task) the lower your need to manually order your lists should be. Like you, I am also uncomfortable with only having un-ordered lists and like to use a pseudo-priotization method to keep me focused. For this I like Linenberger's spin on GTD: http://masteryourworkday.com/blog His method prescribes setting start dates for short term task targeting. 2. Inbox: You submitted an example of defining subtasks and then having them wrongly still be in the inbox. To me, once you defined those tasks under the project, I immediately thought "oh good, they skipped the inbox". So your dilemma confused me. I think of the inbox as my lazy box, not the only-point-of-entry-for-every-item. Its for stuff I jot on the go but don't want to define at that time. If I take a few more seconds to define the item (by choosing folder, project, context, start date, etc etc), then it automatically has bypassed the 'inbox' and is IN the system where it needs to be. For me, the inbox is not a specific folder or other type of container, it's a filtered view of anything with no context, no priority, no folder, no project, etc. Remember, GTD was born of a paper system. 20 years ago your entire 'trusted system' wasn't contained within your little pocket notebook. It was in your desk back at the office or home. In those days, the BEST you could do was maybe note how you were going to define it once you got back to your system to properly file it. Whether it was defined in your head or not still didn't prevent it from living in your inbox until you could properly put it in it's place. Now we DO have the entire system in our smartphone. So the inbox idea is important as it enables us to lazily jot down thoughts and ideas but if we are able to define it upon entry then it skips the 'inbox'. I also left and came back to Toodledo, but this time simplified my approach. I learned from Todo.txt (https://github.com/ginatrapani/todo.txt-cli/wiki/The-Todo.txt-Format) the art of putting contexts and project words or tags within the same field/line of the task item and then using search which is available in every text file and every spreadsheet or database and Toodledo. In this way, I can even have a task assigned to more than one context (eg, shop, computer for online shopping, or, family, birthday for my sister's birthday. And then there is no fiddling with other fields or third party views. The exception to this is if I want to use pocketmod - I then populate the folders as needed for that. And, I love the Toodledo calendar - I hardly ever go to Google cal anymore. One click and I have agenda view of 1 day, 1 week or 1 month, sorted, or not. I do put a 2 letter abbreviation at the beginning of each task and have the default sort be alphabetical. (eg.k, "FI pay bills" and "FI sort receipts" = finance section of my list. That is easier than folders for me. I did not like the idea of on big text file as ToDo.txt users promote because I could not find a good cloud/mobile interface to it. Otherwise, I use most of those ideas. I also use the star sort of like my 'critical' list as mentioned by Lindenburger. It is so easy to sort by and toggle on/off. I experimented with the Q trick (http://www.kungfugrippe.com/post/453204090/q-trick). That works really well! Best wishes to all for happy new year with joyful simplicity! i've stopped looking for alternatives to toodledo as it has proven to be a huge waste of time for me time and time again. Nothing comes close. I do use reqall as a nice voice capturing tool that instantly fills google calendar based on speech and is outstanding. I also use the messenger feature on reqall for reminders or calender appointments. My real GTD happens on toodledo. As close to perfect as I can get. I keep trying to use evernote as capture tool without success but I think that's my fault as I don't process it like an inbox. (until now) Now if someone could write a toodledo app for my playbook!! I am new to Toodledo but everyone else is right about the others do not give me everything I need. I am surprised that no one here has talked about Hotlist for sorting. I have 10 areas of focus at my work so I place those in folders in addition to one for work general and personal. I originally thought that context would be important but I sit at a desk so everything is available to me. I am also using start date, due date, status, priority, alarm, and the repeat function. Hotlist will sort using due date, priority, and next action. This way overdue items are at the top. On time items with top priority are next. I am emailed every morning with this list. I use the start date to keep items out of this list and due time as a way to calendar when to do things at specific parts of the day. Just today I forgot about a task that I had programed the night before and then all of a sudden the rooster alarm on my I pad goes off and an email pops up on outlook to tell me what to do next. You should not have to search items or go through the pains of numbering. I delete completed tasks to get them out of the system and I am not using subfolders yet. I will simply update tasks. I am using voicemail for capture since it is linked to my email. I make use of forwarding non-voice emails to toodledoo to make new tasks and they go directly to the work general folder. David Allen told us that this system is to help us not think of what to do next so that our minds remain clear. Toodledo is doing that. I could probably make this work on Outlook by trying to calendar everything and use tasks and reminders. But that is too much work. Toodledo is designed to make lists and the hotlist is the only one I use. It is the focus activity of my reviews. i've stopped looking for alternatives to toodledo <snip> ... Now if someone could write a toodledo app for my playbook!! As far as I understand it, it is easy to convert an Android app for the upcoming (supposed to be this month) OS release which includes an Android player. @PeterW thanks. I had seen Nirvana, but the mobile web app put me off. @Jeff - NirvanaHQ is about to start beta testing its new native iOS app so it won't be long before there is a good quality alternative that is built specifically for GTD. 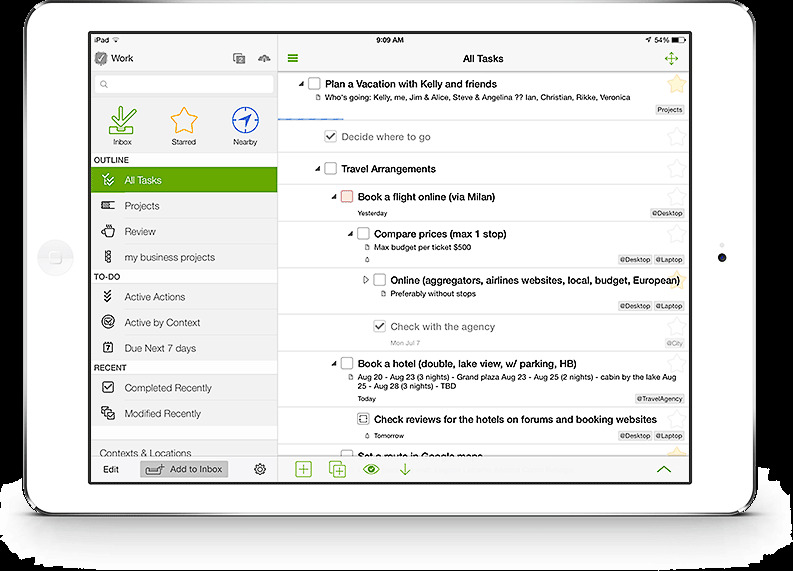 I've just moved all my tasks over to Appigo's Todo Online. My main issue with Toodledo is project handling. I have other issues too such as lack of an proper inbox, general interface issues, lack of drag & drop, etc. The move was painless... I already use Appigo Todo on my iPhone so just changed the sync settings and everything went to the new server. So far I am really liking it - similar to their iOS app, it is feature-rich yet maintains a simplicity of design that makes it easy and fun to use. thanks for all the nice replies. I am still using Toodledo; GetItDone has a new version, but the native Android app is not yet out, Nirvana has released a couple new versions of the Android app that are almost as bad as the one I tested, and Thymer has not released any native apps at all. I did switch from Ultimate To Do, to Pocket Informant. Mostly because the calendar display in UTD really rocks; the interface for tasks is only minutely better in PI than UTD, and I have had some minor stability issues (that seem to resolve themselves given an hour or so) but the calendar is simply so much better than the native android calendar, wow. I have some stuff to digest, after looking at the posts, especially the one by chrisyeung! Thanks again. I promise to keep you guys posted! Safe to say i left Toodledo. And i am predominately an Android user. The ecosystem that i switched to? MyLifeOrganized. Back a few months I wrote what is the use cases you need for a task management solution. Note many applications can just give us something like this. I was harping on Google Tasks! If Google will just focus on this area. but the android one is one of the most functional hierarcial to do list i came across. what i really don't like is the pricing. let me know whether u have use it and like it or not. This message was edited Apr 13, 2012. It's unusual to see someone mention MyLifeOrganized in these forums. Most only mention more recent programs. However, I have monitored MyLifeOrganized for many years. In fact, it was one of the first programs I considered many years ago. I am trying out their Android program now. MLO takes a different approach to task management than does Toodledo, an approach that appears to offer benefits in some ways. Their tree-based system apparently allows for more hierarchal tasks, the multi-level sub-tasks that many Toodledo users want so badly, myself included. However, maybe I've just been using Toodledo too long, but the tree-based system just appears a little more difficult to follow than Toodledo's approach. One area that Toodledo really shines above MLO, at least compared to MLO's Android program, is the vast amount of search options. It is in saved searches that I find myself 95% of the time when I am in Toodledo. You can tailor your view pretty much anyway you want it instead of just a canned view. I am continuing to monitor MLO, though. I still find it intriguing, and with their new cloud sync options, it is looking better all the time. As you noted in your linked review, it does appear that MLO has revved up it's development. But for now, Toodledo seems to work better for me. Thanks for the info on MLO. I looked at it too, it looked really nice, but I could never get it to work properly on a Mac. It was supposed to work OK under Crossover, but it didn't. The Crossover folk tried helping me out, they could not get it to work, and it did not seem to be a priority for the MLO folk. End of story for me. At the time it first appeared, MLO was widely regarded as a rip-off of Life Balance. Life Balance started out on Macs, and is still available, but is not being updated frequently.